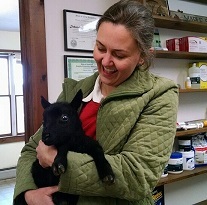 Dr. Major graduated from Tufts Veterinary School and joined Green Mountain Bovine and Equine Clinic in 1989. He and his family live in Westminister West, Vermont. Stephen is licensed and accredited in VT, NH and MA. After graduation from Notre Dame, Dr. Boyd graduated from University of Illinois College of Veterinary Medicine and joined our clinic in 2006. Debbie is licensed and accredited in VT, NH and MA. Our friendly business manager takes care of our clients and helps look after our patients.